The Yankees signed this Puerto Rican giant in 1988 after selecting the 6’7″ right-hander in the 15th round of that year’s amateur draft. During his senior year at Miami Lakes High School in Hialeah, Florida Munoz was a star basketball player who had scholarship offers to play hoops at several big-time schools. In fact, he planned on playing on the hard court at UNLV but bad grades forced a change in those plans and he went to Palm Beach Community College instead. That’s when the Yanks drafted him and convinced him to give professional baseball a shot. 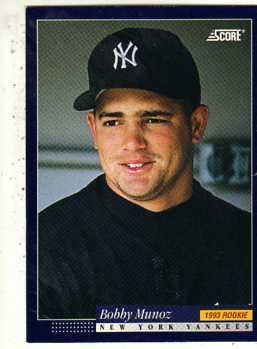 He spent four-plus seasons in the Yankee farm system, where he was converted into a closer when he reached Stump Merrill’s Columbus Clippers Triple A team in 1993. After starting out the season there with a 3-1 record and 10 saves, the Yanks called him up to the Bronx in late May to join Buck Showalter’s bullpen. A confident 25-year-old at the time of his call-up, Munoz asked for and received Goose Gossage’s uniform number 54. He then spent his first month in pinstripes reminding New York fans of the Goose, pitching in a setup role for then-Yankee closer Steve Farr. By June 29th his record was 2-0 with 3 holds, 17 K’s and a solid 2.50 ERA. Unfortunately, he faltered in the second half and then the Yankees grew concerned about his weight, which had gotten above the 260 mark by the end of his debut season. He got his weight back down that winter but was unpleasantly surprised at the beginning of the Yanks 1994 spring-training camp to find he had been dealt to the Phils in the deal that brought starting pitcher Terry Mulholland to New York. The Phillies tried to make him a starter again and his 7-5 record in that role during the strike-shortened season of 1994 indicated there was some wisdom behind the move. But he hurt his arm the following year and went a combined 1-14 during his final five big league seasons. This Hall-of-Fame Yankee outfielder, this former Yankee starter and this WWII hero all also were born on March 3rd.